Click Here to become a 2018 Summer Volunteer! 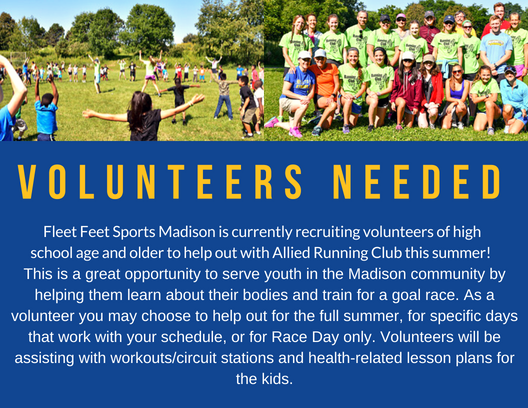 About the Program: Allied Running Club is a non-profit summer program run by Fleet Feet Sports Madison & Sun Prairie with the help of Madison School and Community Recreation (MSCR) staff. Allied Running Club aims to fight childhood obesity and promote a healthy, active lifestyle, by educating kids about their bodies and helping them to train for a laps-based goal race as well as for a relay race on Tuesday, August 7th. About the Practices: We will meet with kids twice per week at Marlborough Park off of Apache Drive in Madison, WI. General practice will consist of warm-up drills, speed and agility exercises, workout, and cool-down. Some days may have a specific focus such as strength training, relays, yoga, endurance, power, or sprint-work. Educational Component: We will have a 15-30 minute lesson plan each practice educating kids on each of the different body systems, and other topics such as nutrition and goal setting. Benefits of Volunteering: Aside from the rewarding experience that comes with volunteering for the program, it is an excellent resume builder and is a great way to give back to the community. If you are considering a future career in Coaching, Teaching, or related to Kinesiology/Exercise Sports Sciences, this is a great opportunity for you to gain experience with a different demographic of kids. If you know of anyone else who would be interested in volunteering this summer to motivate and help coach kids, please continue to pass the message along. Preference is to have consistent volunteers, but we will take all the help we can get. Consistent volunteers will be able to have more leadership opportunities within the program. We will also accept volunteers who can only help out for race day. Thank You!